Blue triangles of different size superposed on a turquoise and blue-grey background. Cones with legs and spots. 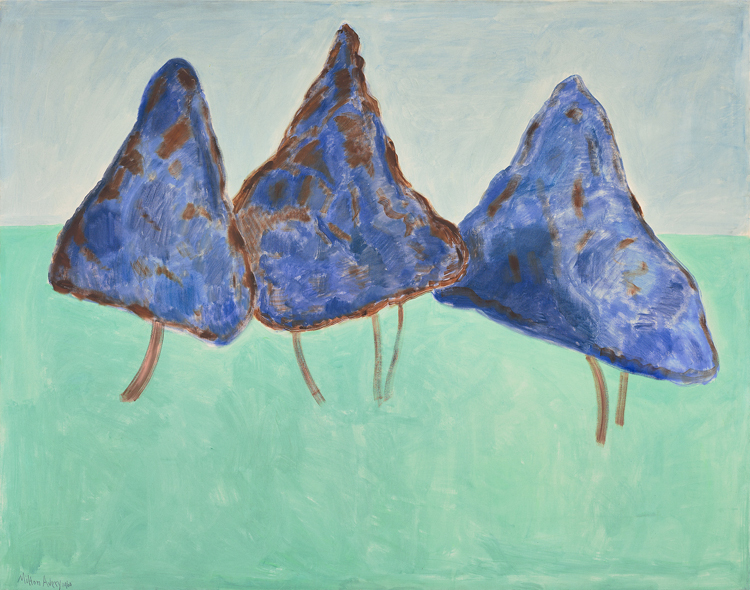 Milton Avery’s abstract painting evokes something more like a dream than a landscape. The swaying of these cones is discernible; the circular brushstrokes of the cones in the foreground in comparison to the straight strokes of the background show movement. Candy corn from the Halloween trick or treats of my childhood comes to mind. The kernels float around and echo the movement of the wind. Shrubs begin to appear, branches and leaves sprout out from what once was a two dimensional triangle. The wind picks up as the cones are completely covered in a homogeneous surface of leaves. The wind whistles through the leaves; the cones still swaying with the wind, now swaying with the whistling. Finally, trees appear instead of cones, dancing against the wind on a flat landscape of turquoise grass. The landscapes on view in Seeing Nature can inspire any number of different emotions and reactions. Does one of the works from the exhibition stand out to you? Take a stab at your own freewriting exercise in response! Let your pen take the lead and send us the result at contest@phillipscollection.org for a chance to win a Phillips gift bag. We’ll feature our favorite submissions here on the blog.